I love being a tour guide. For more than 20 years, that was my primary work. But for well over a decade, I have not led a tour. 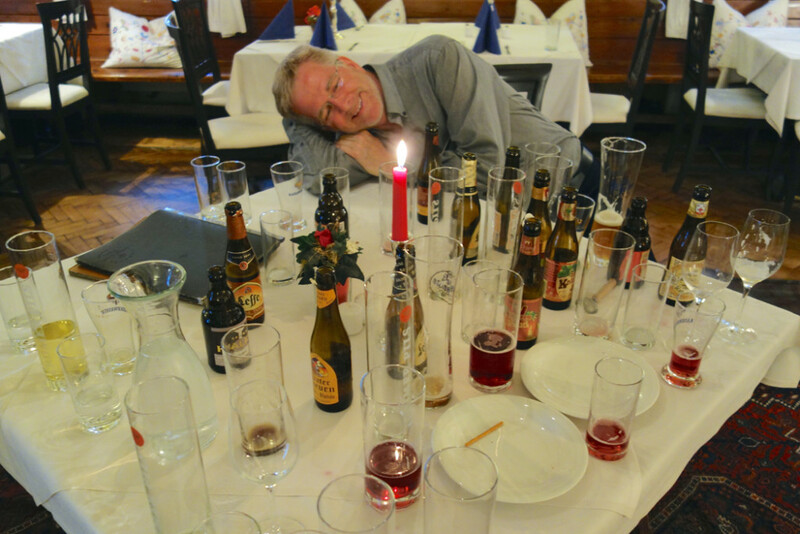 (Instead, each year, I've signed up as a participant on a Rick Steves tour -- which I absolutely love.) This year, I decided to get back in the saddle and actually lead two tours: our My Way Alpine Europe Tour (which I've just finished) and our Best of Europe in 21 Days Tour (coming up this September -- stay tuned). 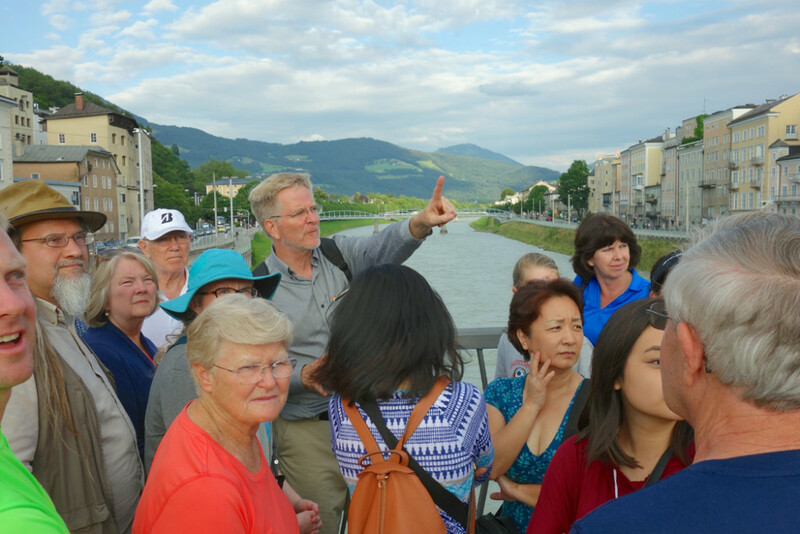 At Rick Steves' Europe, we have fully guided tours, family tours, and My Way tours -- that's the type I just finished leading. My Way tours are un-guided, including just the bus ride, the hotels (with breakfast), and a tour manager (that's me) to be sure everyone is organized and knows what to do. The rest is up to each tour member. My Way tours are quite popular with families, older travelers who want to take it easy, and independent types who don't want the expense and regimentation of a fully guided tour. My group didn't know I was their leader until we met in person. (I was listed with a pseudonym on the roster.) It was a lot of fun to surprise the group at our orientation meeting that first evening at our Salzburg hotel. This shot is a few minutes later, as I give our group an orientation walk of Salzburg. I am so proud of the quality of our bus drivers and their buses. Hilde was our driver. (On this tour, I learned why she's a favorite among our guides.) And her bus is smooth and comfy -- far better than the buses I remember using back in the 20th century. One of my favorite things about the way we do our tours: twice as many seats as there are travelers...and plenty of room to stretch out. 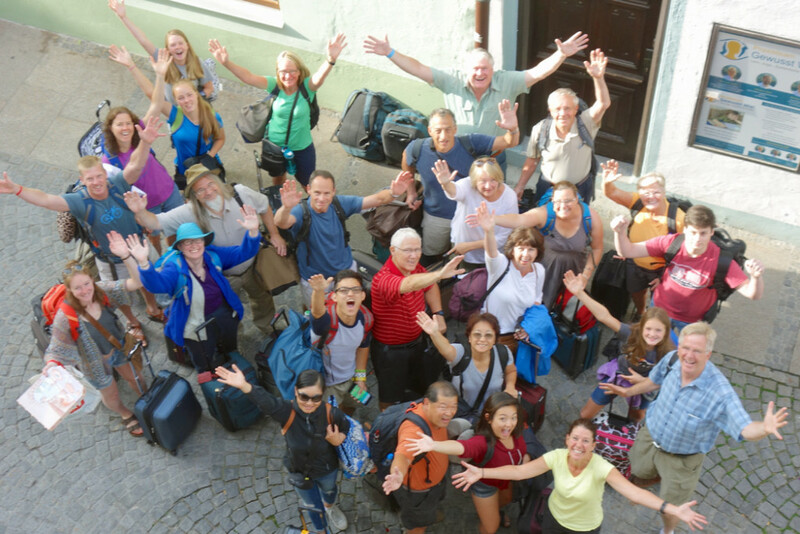 Here's our group with their bags ready to walk to the bus from our Füssen hotel (in Bavaria). When choosing hotels for our tours, a central location (often in the traffic-free zone of the old town) is a priority. That's why we often need to walk a couple of blocks to get to our bus. On our tours, everyone packs light (carry-on sized bags only), and everyone carries their own luggage. That requirement helps shape our clientele -- attracting a hardy and fun-loving gang of travelers...and prompting high-maintenance travelers to choose another tour company. I have to admit, it was great to get back into the guide's seat. 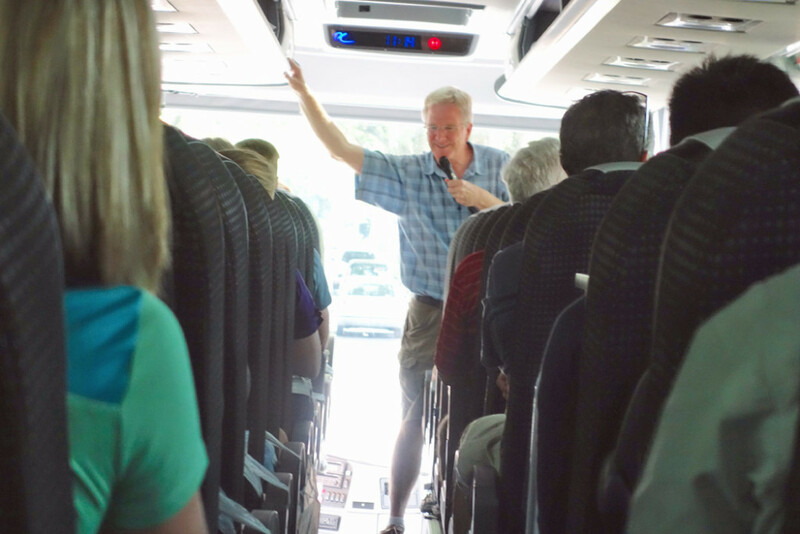 There's nothing like having a mic and a busload of eager-to-learn travelers when driving through the wonders of Europe with so much to talk about and share. Our My Way tours come with a lot of free time. Each day, our group was free to explore from the efficient springboard provided by our hotel. 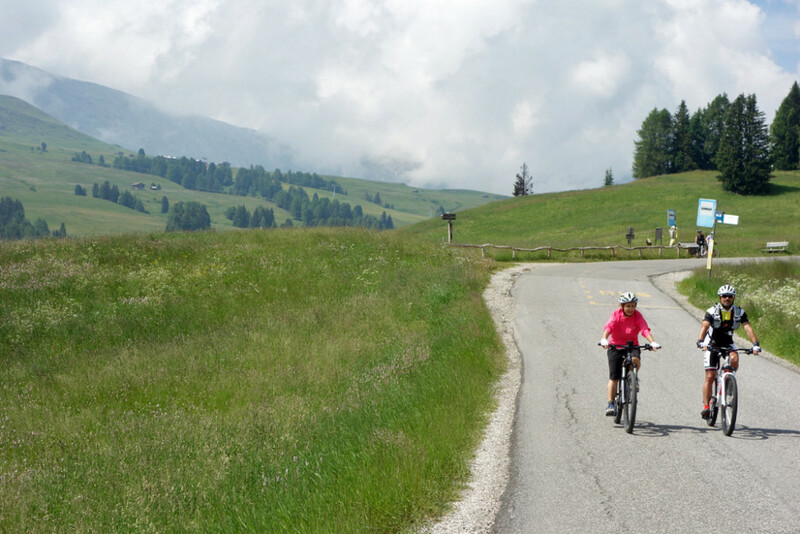 Here in the Italian Alps, our group had an entire day to hike and bike in Europe's largest high-alpine meadow, the Alpe di Siusi. One of my favorite things about our My Way tour was hosting a happy hour. Trish and I bought the most typical local liquors, schnapps, firewaters, and wines, and then made a fun tasting education out of it in our hotel's lounge. When the happy hour was over, the table looked like a chemistry lab littered with beakers. By the way, Trish -- who took all of these photos -- has been reporting on this tour on her own blog. 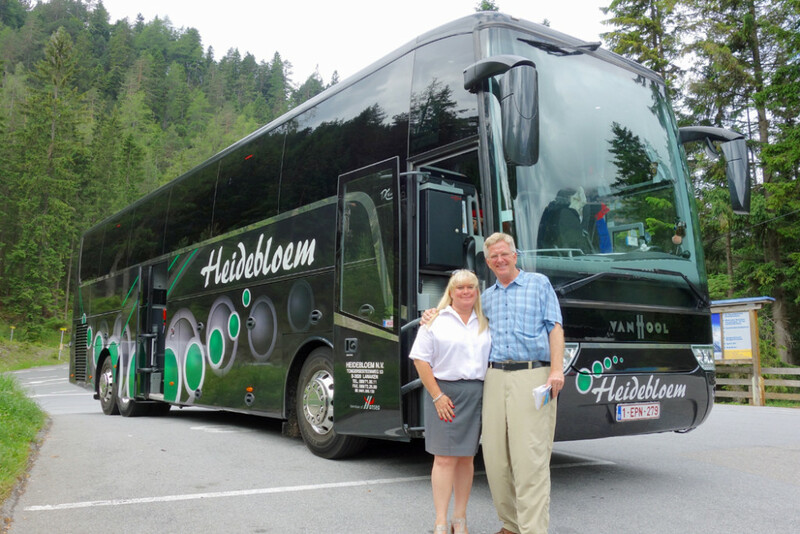 If you'd like Trish's take on our My Way Alps experience, visit The Travelphile. This is Day 66 of my 100 Days in Europe series. As I research my guidebooks and make new TV shows, I'm reporting on my experiences and lessons learned in Vienna, the Alps, the Low Countries, England, and beyond. Find more on my travel blog.